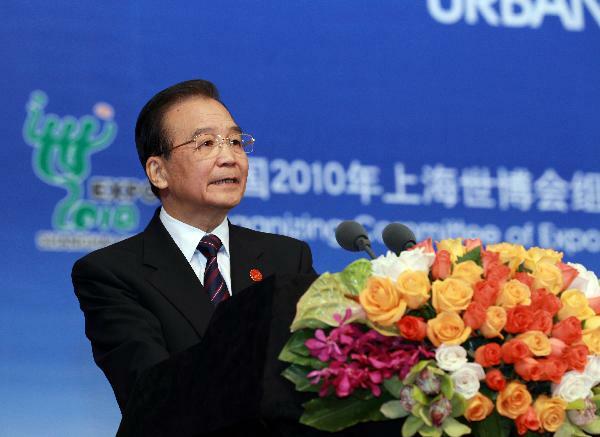 (news.xinhuanet.com) The following is the full text of Chinese Premier Wen Jiabao's speech delivered at the opening ceremony of Expo 2010 Shanghai China Summit Forum held in Shanghai, east China, Oct. 31, 2010. The Expo 2010 Shanghai China is coming to close. This is an Expo that has attracted worldwide attention. Under the theme of “Better City, Better Life”, the Expo has put on display the splendid achievements of contemporary civilizations, pooled human wisdom in exploring the path of urban development, set many Expo-related records, and added a glorious chapter to the Expo history. Expo 2010 Shanghai has been a successful event. A total of 246 official participants, including 190 countries and 56 international organizations, have taken part in this Expo, more than in any previous Expo. Since 1 May, there have been more than 70 million visits to the Expo, another record number in the Expo history. People form around the world streamed to the Expo Site situated along the beautiful Huangpu River. Undeterred by the searing heat or soaking rain, they waited patiently in long lines to witness this much anticipated event. For the first time, an Online Expo was launched, opening a new window for more people to be part of the Expo. Through such extensive participation, Expo 2010 Shanghai has truly brought together people around the globe. Expo 2010 Shanghai has been a splendid event. The Expo Site, which covers about six square kilometers, is like a global village. Here, you can find a rich variety of structures, each with its distinct and exquisite style, the British Pavilion resembling a huge dandelion dancing in the breeze, the Canadian Pavilion in the shape of a maple leaf, and the Saudi Pavilion which looks like a sailing treasure boat. And they all speak to the best of human ingenuity. Here, you can see on display rare cultural treasures of the world: the bronze chariot and horse sculpture from China’s Warring States period, the statue of Athena from Greece, the masterpieces of French impressionist painters, the Litter Mermaid from Denmark and the Aldabra giant tortoises from the Seychelles. They are truly a feast to the eyes. Here, over 100 cultural performances were staged every day. Through a total of more than 20,000 cultural events, visitors got a taste of the quintessence of the world’s diverse cultures and found it a rewarding cultural experience. Here political leaders, business people, government officials, experts and scholars gathered together at the series of Expo Forums to share insightful vies an discuss the future of the world, firing people with imagination and inspiration. All this has made Expo 2010 Shanghai an encyclopedia lying open on the land and a magnificent painting showcasing the integration and harmony of diverse cultures. Expo 2010 Shanghai has been an unforgettable event. The Expo has brought together the Chinese people who wish to learn more about the world and foreign friends who wish to know more about China. Thanks to the Expo, they have forged a strong bond of friendship. At the opening ceremony of the Expo, two Tibetan kids from the earthquake-affected Yushu county of Qinghai Province joined kids of different countries and different colors. They embraced each other and held hands together. That scene is a vivid example of human solidarity and fraternity in the face of adversity. Yamada Tomiyo from Japan, known as “Expo Granny,” began her 18 trips to China four years ago in anticipation of the event. When the Expo opened, she bought 183 tickets and came to visit the site every day. There is an old lady in her seventies from the countryside of Zhejiang Province. She rented a small apartment in Shanghai to provide free accommodation to Chinese and foreign visitors while she herself would sleep on a small couch. Her story has touched all of us. I would like to mention in particular the more than 80,000 volunteers at the Expo site, whose green tops and white pants earned them the lovely nickname of “Little Cabbages,” and the nearly tow million volunteers working across the city. Their bright smiles and hospitable services are the best name card for a real China. Expo 2010 Shanghai is the first Expo held by a developing country, the first held in the downtown area of a mega-city, and it was held under the shadow of the international financial crisis. This is a severe test to China and Shanghai. Over the past eight years, we mobilized resources throughout the Country and pooled the wisdom of the world in the preparation for the Expo. The people of Shanghai, in particular, made selfless contributions and the International Exhibitions Bureau and hot countries of past Expos provided valuable guidance. The success of the Expo could not have been possible without the tireless efforts of many people, including the organizers, construction workers, staff members, visitors and volunteers. It is their sincerity, wisdom and hard work that have rendered splendor to the Expo. On behalf of the Chinese government, I wish to express heartfelt gratitude and pay high tribute to all the comrades and friends who have participated in, supported and contributed to the Shanghai Expo. Expo 2010 Shanghai is an eye-opening event, showcasing the best material achievements of human civilizations. It will also leave behind a rich spiritual legacy and a constant source of inspiration. This is the soul of the Expo. Only when the fruits of human civilization are elevated onto the spiritual and philosophical level will they become the common assets of the entire humanity and be passed down from generation to generation. It is therefore highly relevant that we review this Expo and see what experience and inspiration we can draw from it. The World Expo has promoted a new approach to development, i.e., green environment-friendly and low-carbon development. The Expo Site itself is a model of low-carbon development, where the solar power generation system has a total installed capacity of 4.6 megawatts, more than 1,000 cars are powered by new energy sources, and the 165-meter-high chimney symbolic of industrial civilization has been turned into a meteorological signal tower. Many pavilions are built with the latest low-carbon materials and energy-saving technologies, and numerous cutting-edge low-carbon technologies and products are on display. The Urban Best Practice Area, the first of its kind in the Expo history, illustrates the success stories of various countries in urban development and management and depicts a new way of future urban life with interesting cases and vivid models. These innovative ideas show that mankind has acquired a more scientific understanding of what development means and become more rational and mature in the pursuit of development. They will exert a far-reaching impact on the economic growth pattern, industrial structure and consumption model. The World Expo is convincing proof that scientific and technological revolution is a strong driving force behind social progress. Science and technology advances are an important hallmark of social progress. The United Kingdom hosted the first World Expo in 1851, because it was the first country to launch the Industrial Revolution and manufactured a large number of technological products. The industrial revolution spurred an incredible growth in productivity. The productivity generated in the less than 100 years after the Industrial Revolution exceeded the sum total of productivity of all previous times. And the last 100 years have seen even greater increases of productivity than the 100 years following the Industrial Revolution. Expo 2010 Shanghai has shown mankind’s latest achievements in science and technology, such as the new generation of mobile communications, artificial intelligence, new materials and eco-friendly construction, and they speak volumes about the immense human wisdom and creativity. The development, application and dissemination of these news technologies, new energy sources and new materials will not only have a major impact on the way we work and live, but also lead the course of industrial development in the future. They will also provide strong support for our efforts to overcome the underlying impact of the international financial crisis and promote sustained recovery of the world economy. The World Expo is a vivid demonstration of the diversity of human civilizations. The Shanghai Expo has offered a broad stage for inter-cultural exchanges and integration, reminding us that we live in a divers and colorful world. Here, one can see not only the high-tech products from the developed world such as the Unites States and Europe, but also national costumes and ebony sculptures unique to Africa and ingenious handicrafts from the Caribbean and Pacific island countries. These products epitomize the human wisdom gained over the long course of productive activities, and embody the values and ideals of a nation. They are the material form of a nation’s culture. In addition to the rich exhibits, there were dazzling art performances from across the world in the Expo Site every day, including the indigenous African dances, the elegant French court dance, the passionate Argentine tango the refined Japanese Noh theatre, the lively English folk music and the exquisite Peking opera. The artistic qualities of various cultures have added to the life and appeal of the Expo. The World Expo tells us that every country and every nation has a traditional culture to be proud of and that each fine culture is a fruit of human civilization and deserves our respect and care. One flower does not make a beautiful garden. The Expo has fully demonstrated that equality and harmony is the common aspiration of mankind. The Expo is a festive event for all people in the world, and everyone involved in the Expo is an equal member of the big Expo family. Without mutual understanding and trust, and without the live for peace and harmony, it would not have been possible for people form so many different countries and nations to come to this joyous gathering. Among the 14 Pacific island countries and 13 Caribbean countries that made their first collective presence ant the Expo, some are new to the World Expo and some do not yet have diplomatic relations with China. Yet they all participated with great interest and enthusiasm. This is a good example which shows that the World Expo is above national, ethnic and religious boundaries. Providing quality service to the visitors and participants is a top priority of Expo 2010 Shanghai. Many facilities for the convenience of visitors are installed in the expo Site. After careful selection, we invited nine Muslim restaurants to the Site to offer Muslim food. The commitment of taking good care of the visitors is shown in very detailed way. For the first time, a pavilion for disabled persons is established in the Expo Site. There is a variety of special services such as accessible sears for all activities, wheelchair rental and accessible depositories. Each individual is fully respected here. The Expo tells us that progress of a society is not just about the number of skyscrapers, but also meeting the practical and cultural needs of each individual and warming people’s hearts with the sunshine of social care. It has been 159 years since the first World Expo was held. The past one and a half centuries saw two world wars and three important scientific and technological revolutions. Out world has undergone a sea change and achieved unprecedented advancement in science and technology and productivity. The Shanghai Expo has showcased the progress of human society, and also reflected the challenges, concerns and confusions that mankind faces, The Expo spirit means that we must all work together to meet challenges and pursue peace and development. -- We should jointly promote harmonious urban development. More that half of the world population now live in cities. Urbanization has on the one hand enabled people to enjoy the achievements of modern civilization and on the other presented such unprecedented challenges as swelling population, traffic congestion, poverty, cultural clashes and financial crises. 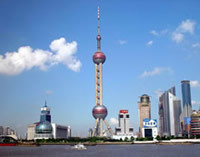 The Expo 2010 Shanghai is the first Expo that features city as its theme and seeks to make pioneering exploration on tackling the common problems facing mankind. We need to review the valuable ideas on urban development generated at the Expo, innovate urban development models, build harmonious cities of high economic efficiency, social justice and amity, cultural diversity and inclusiveness and sound eco-environment, and strive for an even better urban life. -- We should advance modernization in the rural areas. The Shanghai Expo outlines a vision for a better urban life in the future. Yet we must not forget that a large part of the world, particularly the rural areas in developing countries, is still lagging behind and the majority of the poor population live in rural areas, Without the modernization of those areas, modernization of the whole society would not be possible. We should vigorously promote coordinated urban and rural development, work to eliminate the gap between urban and rural areas, promote equal access to public services, and build the vast rural areas into a beautiful homeland enjoying greater productivity and prosperity and a better environment. -- We should help the less developed regions to achieve common development. We see from the eyes of speaker sat the Expo Theme Forums their concerns about uneven development and widening wealth gap in the world. All human beings are brothers and sisters of the big family of the Earth. We should work hand in hand for common development, and do our best to help the underdeveloped countries in developing the economy and improving people’s lives so that people of all countries can share the fruits of human civilization. -- We should cherish and take good care of mother Earth. We can see from the Expo exhibits that, while generation enormous wealth, industrialization, urbanization and globalization have also cost us dearly in terms of resource depletion, environmental pollution and ecological degradation. We should not only see the Earth as something that we have inherited from our forebears, but also, and more importantly, as something that we have borrowed from our children and grandchildren. We must respect nature, place importance on resource conservation and environmental protection, and accelerate the transformation of the development model and economic restructuring in order to achieve sustainable development and leave to the future generation a planet where they can survive and thrive. -- We should jointly uphold world peace and stability. We have felt keenly from the enthusiasm of all countries to participate in the Expo that peace progress, harmony and a better life are the common desire of people all over the world. It is important that countries handle ethnic tensions, cultural frictions and regional conflicts and other hotspot issues in a sensible way, seek peaceful solutions to international and domestic disputes through consultations, remover ethnic estrangement and strife, and work together to build a harmonious world of lasting peace and common prosperity. The Shanghai Expo has offered the Chinese people a good opportunity to learn form the world. One day in Expo is more rewarding that ten years’ reading. The Expo pavilions enabled people to witness the beautiful scenery, precious treasures, splendid cultures and folk customs of various countries. No TV program and book can give us such first-hand experience. The Expo has also shown the comprehensive national strength of each country. From the exhibits, one can see not only the strengths of others bit also the gaps one has to bridge. Only an open and inclusive country can become an advanced one and only by standing on the shoulders giants can one look farther. The success of the Expo has strengthened China’s confidence and resolve to pursue reform and opening-up. China will unswervingly follow the path of peaceful developments of all civilizations, deepen mutually beneficial cooperation with other countries and make greater contribution to the progress of human civilization. The Shanghai Expo is coming to a close, and you will leave Shanghai and return to your home countries. You came with the pride of your individual countries, and you will leave with the splendor of the whole world. The cultural spirit of the World Expo will live on and its stories will be told for years to come. I sincerely hope that the Expo 2010 Shanghai China has been a memorable experience for you all. May the Expo spirit thrive across the world, and may our world be an even better place.